BigKick is an impressive little debut for PB. The sample library is excellent, the synth is focused but flexible, and the whole thing sounds great. The GUI is too dark, and the font used is about as thin as they get. Plugin Boutique is an online shop selling plugins and applications by a broad range of developers, and BigKick (developed by Credland Audio) is the first release of their own. As the name implies, it's a plugin instrument (VST/AU/AAX) dedicated to the generation of kick drum sounds. 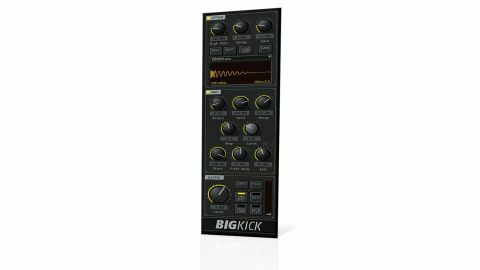 Like its closest competition, Sonic Academy's Kick (for which an expansion pack called Big Kicks is now available, confusingly), BigKick divides its virtual kick drum into sampled 'click' (Attack) and synthesised 'sustain' (Body) components. "Over 300 Attack samples are included, from vintage drum machine classics to genre-based selections, and you can load your own"
Over 300 Attack samples are included, from vintage drum machine classics to genre-based selections, and you can load your own). The controls in the Attack section comprise a high-pass filter, Gain and Decay (1-800ms), while the Body synth features an AHD envelope (with Decay up to 600ms) and five knobs for controlling pitch and the movement thereof. You can set the Start (45-16,000Hz) and End (40-70Hz) pitches of the synth tone, and the speed at which the first bends to the second (1-200ms). Usefully, End pitch can also be set to a musical note value via a menu. The Deep and Curve knobs, meanwhile, shape the pitch envelope. Clicking Edit opens the Tweaks window in place of the Body section. Here, further edits can be made, including pitchshifting the Attack sample (this should be in the main Attack section, really), adjusting the synth gain (ditto but in the Body section), EQing the synth, and dialling in a rather charmless but punchy distortion. You also get a global high-pass filter (30 or 40Hz). Auditioning BigKick is aided by the Autoplay function, which outputs a 4/4 kick on DAW playback with no MIDI input required, and a One Shot mode is available to stop MIDI note length from controlling playback duration. Finally, the waveform display reflects your edits in real time, and you can export your kick drum by dragging from it out to your desktop, DAW, sampler, etc.